What’s different about Veterans Day this year? Well, each year, this Federal holiday is observed on November 11. This year, Veteran’s Day happens to fall on a Sunday, therefore, the following Monday will be designated as the Federal holiday. This means that public school kids (or grandkids) across the U.S. will be enjoying a three-day weekend and sleeping in on a Monday. Since the kids don’t have school, it could be the perfect day to spend quality time with Grandma or Grandpa. 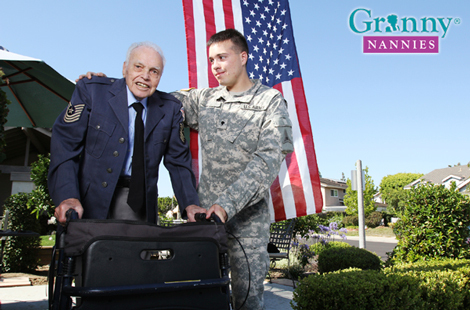 If Grandma or Grandpa served in the military, have your children heard their stories? Do they know about the great friends they made in the military and the reunions they have proudly attended over the years? Do they know how difficult it was for them to be away from their friends and family in the U.S. while they lived and served abroad? There really is no better way to thank a military vet than to ask him or her about his or her experiences. If an in-person visit isn’t possible, maybe the grandkids can Skype or FaceTime and ask for a story about their military experiences. You can take it one step further and jot down the stories that your parent shares, journalist-style. This way, you’ll have it forever as a treasured keepsake of a true patriot. Thank you to all the men and women who have served and who are currently serving in the United States Military.